The European Union should rethink its CO2 reduction strategy because the target set for 2030 seriously risks undermining mobility for the masses. 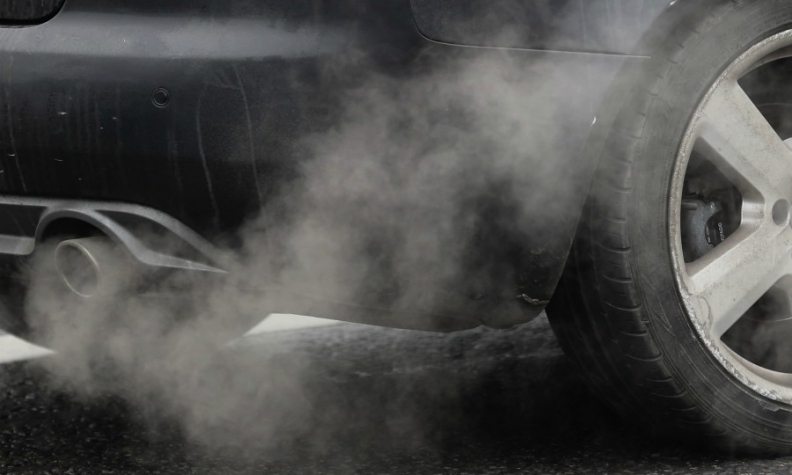 The EU wants automakers to reduce CO2 emissions by 37.5 percent by 2030 from its 2020-21 target of 95 grams per kilometer. That means the average CO2 level would drop to less than 59.4g/km within 11 years. After hearing this figure I wondered whether even a frugal minicar powered by a modern gasoline engine could possibly comply with the 2030 target. Talks with a number of industry and supplier executives all yielded the same conclusion. A gasoline engine would fail to meet the target because only full-electric vehicles and plug-in hybrid electric vehicles will be able to cut CO2 to less than 59.4g/km. While it is clear that some form of electrification will be needed on every new vehicle sold by 2030, the question is whether these low-CO2 vehicles will be affordable to everyone. A number of experts predict that by the late 2020s EVs will match equivalent vehicles with internal combustion engines based on their total cost of ownership. It will take a bit longer for the two to have a comparable retail price. The experts said, however, that plug-in hybrid electric vehicles (PHEVs) would probably always be more expensive than comparable vehicles with traditional powertrains. Today the cost of an EV powertrain – including the batteries, electric motor and inverter -- is more than three times that of equivalent traditional powertrains. The difference is 14,000 euros versus 4,400 euros, Bernstein Research analyst Max Warburton estimates. It seems plausible that over time higher economies of scale for EV components combined with new, less expensive battery cell technology could even the cost difference with traditional powertrains, which will become more expensive because of stricter emissions rules. Reducing an EV drivetrain’s cost premium by two-thirds, however, will probably require some substantial technology breakthroughs on the battery technology in addition to the higher economies of scale. Boosting volumes on PHEVs would have a much smaller effect, according to experts. That is because a PHEV’s engine and transmission are already mass produced. Another challenge to the affordability of PHEVs would come if EV production reached a level where they were less expensive to make than their rivals that have both a plug and a fuel-powered engine. One potential benefit for PHEVs is that the cost of adding the components needed to make a traditional car capable of short-range electric travel – estimated to be 3,500 euros to 5,000 euros -- would become cheaper if those parts were made in high volume to meet growing demand for EVs. Looking at Europe’s best-selling PHEV, the Mitsubishi Outlander, the added cost for its plug-in hybrid powertrain is more than 13,000 euros. To put this cost into perspective, an entry-level Volkswagen Polo starts at 13,500 euros in Germany. Although I have normally supported the EU’s implementation of more stringent regulations -- because the past challenges helped make European automakers more competitive -- this time is different. I think that a 59.4g/km CO2 target for 2030 is unrealistic. Not only will it make basic motorization unaffordable for the masses, it will also clash with reality. In 2017 average CO2 emissions in Europe grew year-on-year for the first time in a decade to 118.1g/km from 117.8g/km the year before (see chart). 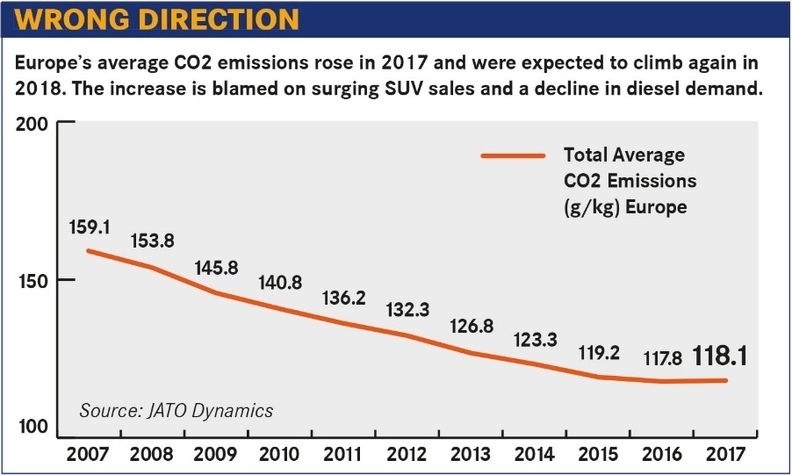 While final numbers for 2018 are not available yet, the CO2 figure is likely to have gotten worse last year because demand for diesels continued to fall while sales of SUVs, which produce more CO2, continued to rise rapidly. Since 2030 remains relatively far away, the EU should step back and set new, more realistic targets that still reduce CO2 and encourage electrification but do so without sacrificing the affordability of basic motorization. Today, a minicar retails for about 10,000 euros across Europe. The cheapest EVs, the battery-powered versions of the Smart ForTwo and ForFour, start at twice that price. Therefore, electrification for the masses remains in the distant future., electrification for the masses remains in the distant future.